Now, I have been a fan of Go Pro for years and have used them in so many projects. In fact I pretty much use them in all my projects if only as a back-up B or C roll camera. I also use them on my Phantom 2 UAV (drone) as well as for the occasional review inside my car. I have also accumulated an awful lot of accessories and gadgets to go with them. Here are a few of those bits, the rest are at home. So, when SandMarc offered to send me a review copy of this Armor Bag, I jumped at the chance knowing that I desperately needed something to carry all that crap gear around. 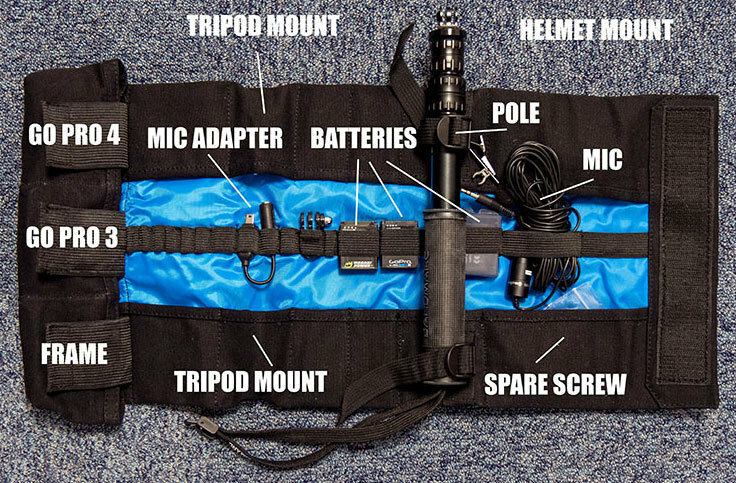 There are some very cool hard cases around that are designed specifically for Go Pro kit which are great for taking all your kit everywhere but I tend to find I only take certain items out with me on jobs. 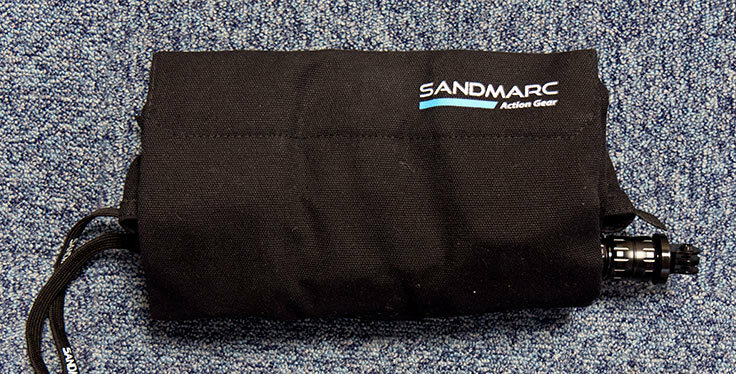 The SandMarc bag is great for carrying just what you need when out and about and folds into a neat pouch that has either a shoulder strap or carry handle making it easy to lug around with all your other kit. Obviously I won’t get all of my Go Pro gear in this bag but would it hold what I generally take out with me? I was able to get the majority of what I need into the bag with no problem and even had space for a few more bits. However, bear in mind that if you were to fill all the spaces in the bag, it wouldn’t fold enough for you to close it with the Velcro seal. This bag seems pretty useful for anyone using the pole on a regular basis. Or attaching the Go Pro cameras to a helmet, snowboard etc. The material is tough and I would feel safe throwing the bag around. When rolled up, the cameras (in their cases) are in the middle and surrounded by another layer of material. It will generally fit 3 Go Pro cameras and up to 30 accessories. Without the pole, it would fold easier and possibly hold larger items. The SandMarc Armor bag will easily fit into my main camera bag which is cool considering I normally have all this gear loose and rolling around. It will hold up to 3 Go Pro cameras and up to 30 accessories. If you remove the pole, you should be able to get more/larger items in there such as the battery eliminator. The lightweight Armor Bag weighs 11 ounces and measures 10″ x 4.5″ when rolled up. Like I said, a selfie stick is a selfie stick and this is just that. However, the colours match Go Pro’s cool branding. The Compact Edition can be used for surfing, snowboarding, skiing, traveling, diving, and a lot more. The pole also has a detachable mount which means it can also be used with cameras using a 1/4″ thread such as the Garmin, Drift and SONY Action Cam.